How Much Does LASIK Cost when my Vision Plan Offers a 15% Discount Off LASIK Eye Surgery? Many vision plans offer a specific discounted percentage off of the usual rates for LASIK. In addition, most plans do not monitor the LASIK costs their members are being charged. Immediately, the patient’s first question becomes, "Fifteen-percent off of what?" Some doctors inflate their LASIK price to compensate for the discount given, leaving you wondering if you received a price-break after all. Many providers run promotions frequently and during these promotions your 15% discount can be reduced to as little as 5%. One very important feature of the QualSight plan is our set contracted pricing. We monitor and manage our Member's LASIK costs, leaving no room for a doctor to inflate the normal charge. 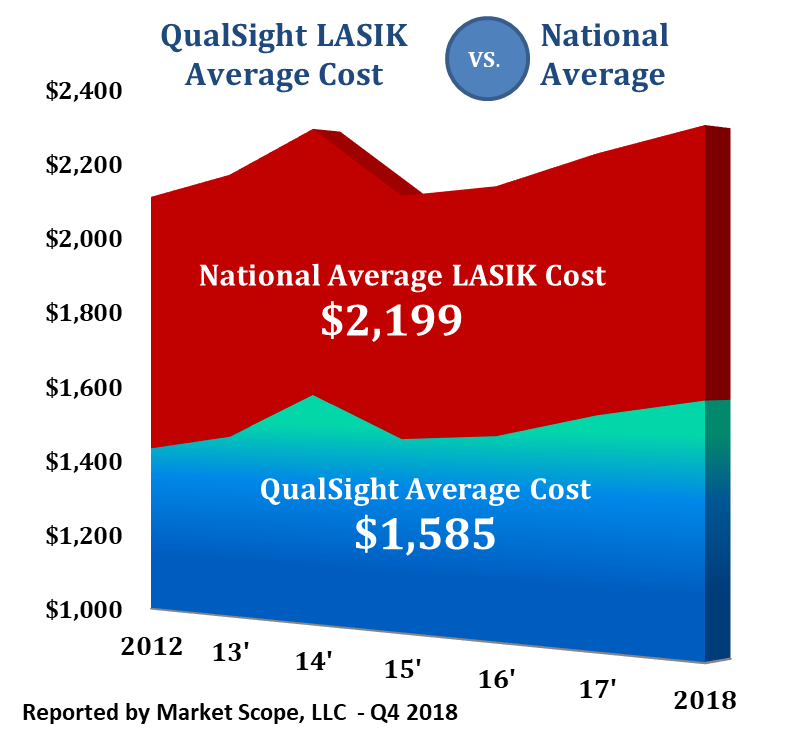 With QualSight the question "How much does LASIK cost" is discussed and handled before the pre-operative exam. Our savings are very real and you will never be left questioning your price of LASIK. How Much Does LASIK Cost with “One Price” Models? The national average LASIK eye surgery cost for doctors who only offer one price in 2015 was $2,259 per eye, up $43 from 2014. There are different FDA approved LASIK procedures and research is required to learn about what type you are being offered. How Much Does LASIK Cost with Groupon or a Coupon? When doing comparison shopping it is important that you understand what's included in the LASIK price. For example, LASIK Groupon advertisements typically offer LASIK at very low prices per eye often treat only very low prescriptions, with little or no astigmatism. As the patient’s prescription increases, prices increase as well. In addition, patients may only have access to specific lasers and each laser is manufactured to treat specific prescription ranges and pupil sizes. Don't be fooled by $399 ads and coupons that are too good to be true. $399 per eye sounds like a pretty good deal for LASIK eye surgery and you may have seen this price advertised before, but buyers beware because bargains like this are unfortunately always too good to be true. Patients rarely, if ever, pay the actual amount advertised and it is unlikely that you will only pay $399 per eye on LASIK. If your prescription or pupil size falls out of that range, you are automatically disqualified for LASIK at their advertised price. Often less than 2% of all eligible LASIK candidates qualify for the "starting" $399 price.